Ozone Ayurvedics is a Consumer Healthcare organization with expertise in Skincare. This company was established in the year 2000 and is into Herbal and Ayurvedics products with a vision to make use of the holistic approach of the ancient science of Ayurveda. 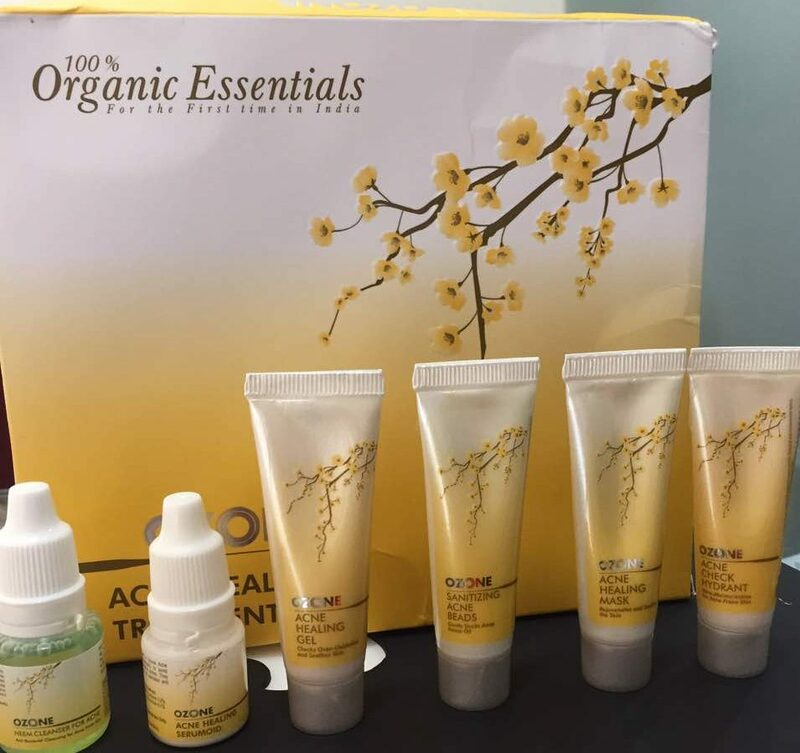 Their new product Ozone Acne Healing Treatment Kit was sent to us for a trial. The box contains of 6 products, Neem Cleanser for Acne, Sanitizing Acne Beads, Acne Healing Serumoid, Acne Healing Gel, Acne Healing Mask, Acne Check Face Wash, Acne Check Hydrant. 1] Start with the Ozone Neem Cleanser for Acne on a cotton ball. Dab it over active acne and softly dab is all across your face so that all the excess oil is removed. 2] Move over to the Ozone Santizing Acne Beads. Apply the product and leave it on for about 5-7 minutes as per the instructions on the box. It contains Aloe Vera, camphor, jojoba and thymol along with essential oils of clove, lemon and eucalyptus. After the first 5 minutes, massage your face gently with your fingers in a circular motion. Wipe it off with a moist cotton ball and dry out your skin completely. With this the cleansing process is complete. 3] Next, apply the Ozone Acne Healing Serumoid on your face and neck, massage is thoroughly in circular strokes till it gets absorbed by the skin. Do not apply on your lips and eyes. 4] After the Serumoid is absorbed by the skin, apply the Ozone Acne Healing Gel on your face and neck and similarly massage it for 10-15 minutes. Once done, wipe it all off with a damp towel. 5] Evenly apply the Ozone Acne Healing Mask on your Face and Neck again avoiding the lips and eyes. Let it stay for about 10-15 minutes until dry. Gently massage over it and wipe it off with a moist cotton ball so that there is no residue left. Make sure all of it is wiped off. 6] Finally, apply the Ozone Acne Check Hydrant and massage it gently all over your face and neck untill it gets absorbed. And you’re done! Your skin will definitely feel fresh and rejuvenated post this process and after a day or two you will see considerable results. Do share your experiences with the product in the comments below. P.S. The images in this post are of the trial product which is a mini pack, quantity – 40g +15 ml.